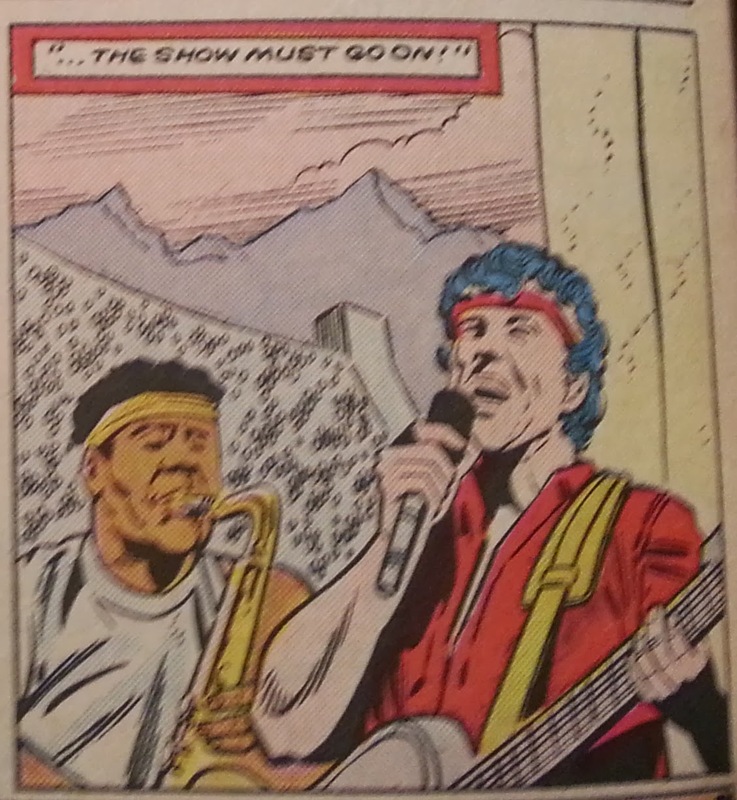 Legends of Springsteen: Comic Book Review - Transformers #14: "Rock And Roll-Out!" 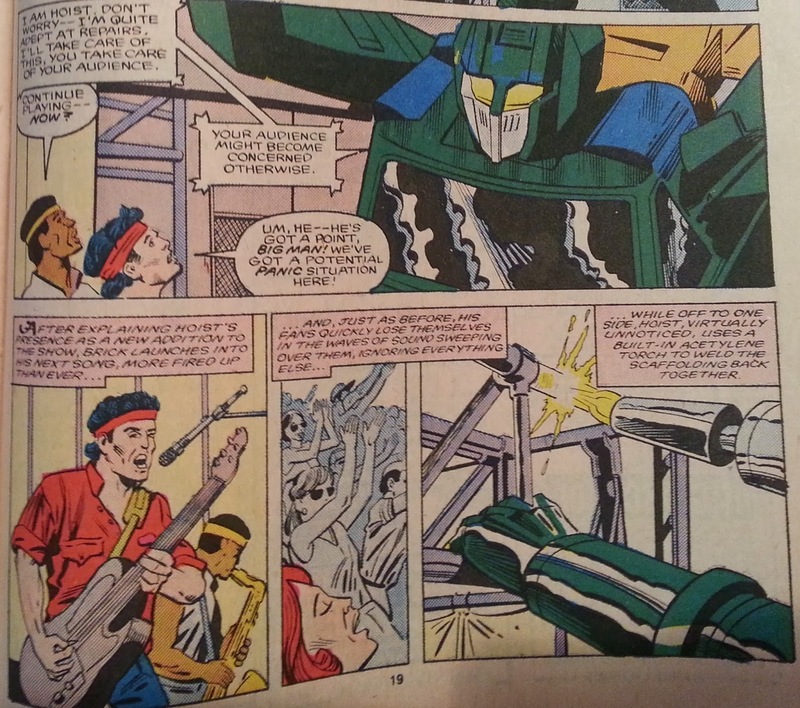 Comic Book Review - Transformers #14: "Rock And Roll-Out!" Has Bruce Springsteen met the Transformers? Of course not, you idiot. 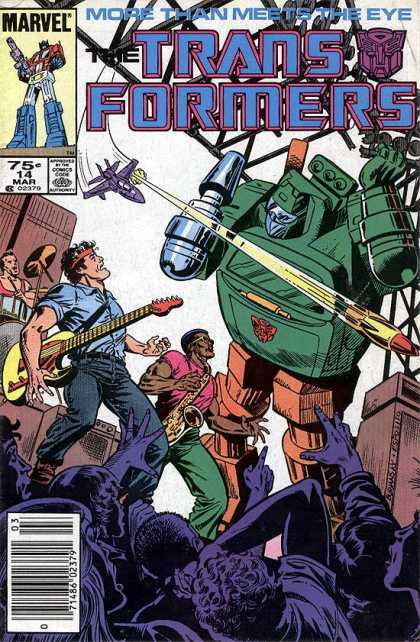 However, in the mid-1980s, legendary Transformers comic book writer Bob Budiansky tackled the question that has plagued us all: what would happen if Bruce Springsteen met the Transformers? 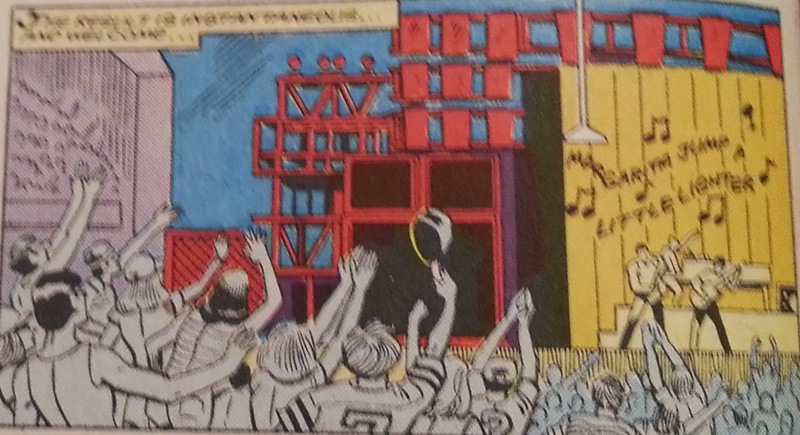 The answer lies in issue 14 of the original Transformers series. Should you be unable to attain a copy for yourself (I mean, an issue this rare is trading on Amazon for $0.75! ), please make due with my humble recap. Let's hit the basic plot points first: the book opens with Jetfire becoming an Autobot (yay!). Then, a machine is used to revive five old Autobots back to life (yay!). Next, we peak into the nefarious Decepticons, who are looking to steal energy (boo!). Now, let's rejoin the story, as the newly revived Autobots hit the town to learn the customs of the humans. 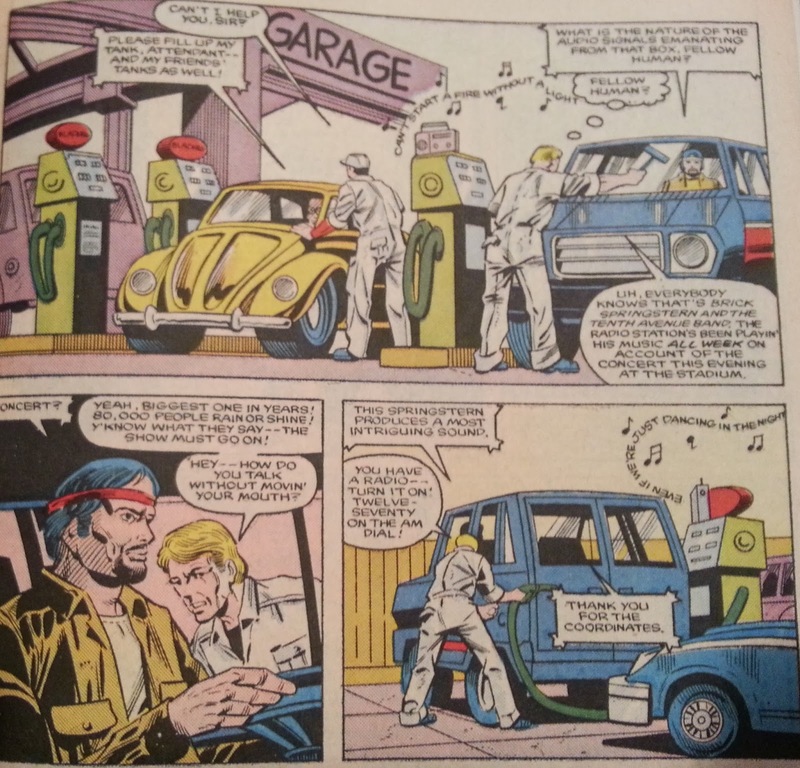 As the Autobots pull into the gas station, they are immediately greeted by the pleasant tones of Bruce Springste--er, I mean, Brick Springstern and the Tenth Avenue Band. Of course, the blue-collar gas station attendants would listen to nothing else. Springstern's hit song "Dancing in the Night" is playing, and one of the Autobots (I believe his name is Skids, so let's go with that) takes an immediate liking to the tune. At this point, Optimus Prime chimes in, and explains the plot (for those of us still confused). Basically, the Decepticons are stealing sonic energy, or something like that. Where are they going to get said sonic energy? Why, through the sonic energy produced by mister Brick Springstern and the mighty Tenth Avenue Band! We are treated to one more Springstern classic, "Born To Ride", and off the Autobots go into action. Skids: My analysis indicates a rhythmic tonal quality, Tracks, that positively stimulates the cerebro-circuitry. The Autobots find some power cord that the Decepticons are using to steal the sonic energy, and mayhem ensues. During the chaos, the lighting scaffolding above the stage breaks, but fortunately, Autobot Hoist is there to save the day and repair the scaffolding. Obviously, 40-foot robots attacking each other in an 80,000 seat venue could cause a panic, but that's where Brick Springhornstern comes in: he keeps playing. It really is a Sophie's choice that I believe we have all wondered: if giant robots from outer space are attacking each other during a Springsteen concert, do you run for your life or stay at the show? Who am I kidding, I know we'd all stay at the show. The good robots eventually chase the bad robots away, to battle again in next month's issue. 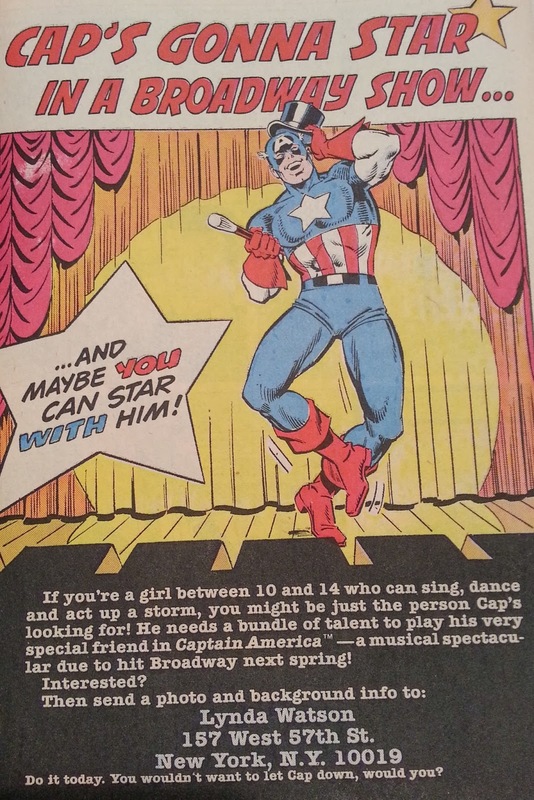 And, on a non-Springsteen related note, did you know that there was supposed to be a Captain America Broadway musical? Now, according to my extensive Internet research (also known as the first link I see after I Google something), the musical never happened. But, this magnificent advertisement still lives! I love everything about it: Cap's top hat, his wiggle, the guilt trip message at the bottom ("You wouldn't want to let Cap down, would you?"). Unfortunately, Cap let us down by never making it big. While this comic is no Watchmen (nor is it Wings for Wheels, a fantastic Springsteen-based comic), I still enjoyed it for what it was: 20-odd pages worth of classic 80s goodness. I'd give it 4 out of 5 Bricks, and definitely worth a couple bucks to add to your collection. Play us out, Brick!